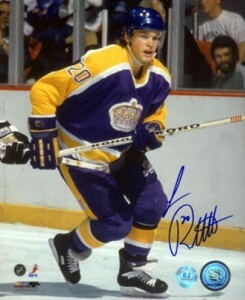 One of the greatest scoring threats of his time, Luc Robitaille hockey cards and memorabilia were popular both during his playing career and into his retirement. He played for four different teams during his 19-year NHL career. Fourteen of those were spent with the Los Angeles Kings. However, Robitaille would win his only Stanley Cup while playing for a brief stint with the Detroit Red Wings. At the time of his retirement, following the 2005-06 seson, he was the highest scoring left winger in the history of the NHL. 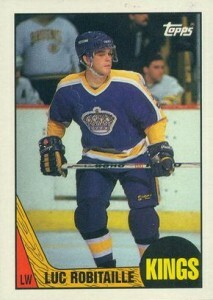 Luc Robitaille's rookie cards are in 1987-88 O-Pee-Chee and 1987-88 Topps. The O-Pee-Chee version is considered by most collectors to be the more desirable of the two. His first certified autograph can be found in 1994-95 Be A Player. Despite not being serial numbered, it has an acknowledged print run of 2,400. 1999-00 Upper Deck Piece of History Hockey has Robitaille's first game used memorabilia card. An autographed version of the card also exists. It is very rare, being serial numbered to just 25. 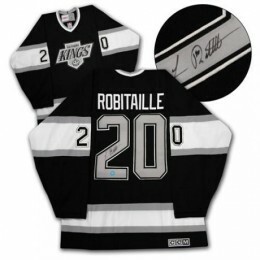 As a member of the esteemed 500 Goal Club, demand is strong for Luc Robitaille's autographed memorabilia. 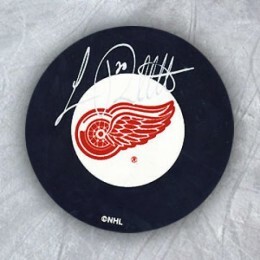 Sticks and pucks are some of the items he is most often asked to sign. While they display the same image, there are a couple of primary differences between this and the Topps version. The most noticeable is the logo used on the card front. The other difference is that the back of the O-Pee-Chee card is written in French and English. The Topps version of the card can often be found with better centering and edges. However, demand for the O-Pee-Chee version still causes it to sell for more money than its Topps counterpart. 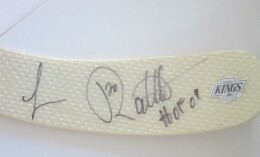 Below you will find an example of what Luc Robitaille's authentic signature looks like. This can be used as a first point of reference for determining the legitimacy of autograph memorabilia, but is not a substitute for having your items authenticated by a well-respected professional autograph authentication company. Some of the trusted sources within the sports memorabilia market include the following companies: PSA, JSA, Tristar, and Mounted Memories. Click on any of the images below to view full size photos. The signature is largely defined by the initials "L" and "R."
The "L" varies. Sometimes it has a loop on the top and bottom. Other times it loops just on the bottom. The "R" is written in a manner that the vertical pen stroke comes down before coming back up forming an incomplete loop. The pen then flows into the rounded part of the letter. It does not connect to the vertical line. He often places his jersey number inside the rounded part of the letter "R."
The remaining letters of the last name resemble a series of the letter "l." They are narrowly spaced and repeated four times. 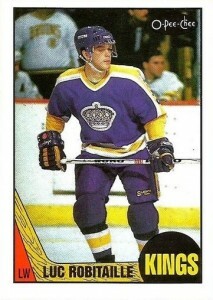 I have pro set card from 1991 of LUC ROBITAILLE ON THE FRONT WITH GRETZKY ON THE BACK. Is it worth anything? not grade but in very good shape. Did you ever find out about the Robitaille Card?? I’ve just found one too!! !